Visit the Central Highlands as provinces there celebrate their NationalTourism Year, and you'll find a peaceful landscape of rolling mountains and magnificent waterfalls. 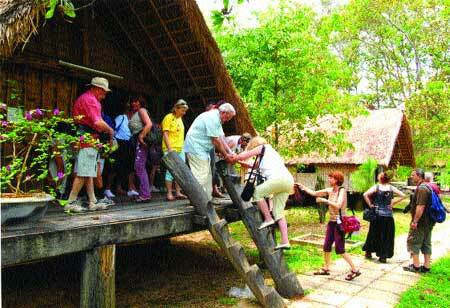 Ethnic tourism: Foreign tourists visit a long communal house of the E De ethnic group in the Central Highlands Province of Dak Lak. Tay Nguyen-Da Lat's national tourism year has kicked off throughout the Central Highlands provinces of Lam Dong, Dak Lak, Dac Nong, Gia Lai and Kon Tum. Tay Nguyen (Central Highlands) is famous for its cong chieng (gongs) culture, which had been recognised by UNESCO as a Masterpiece of Humanity Heritage of Mankind. It is also well-known for its communal houses and intense fragrance of Dak Lak coffee as well as beautiful villages hidden in high mountains and thick jungles, and natural waterfalls, said Nguyen Van Huong, director of the Lam Dong provincial department of Culture, Sports and Tourism. Huong said many local and foreign tourists and travellers visit the region to wallow in fresh sunlight and wind, particularly enjoying wild sunflowers which are the symbol of Tay Nguyen. Overseas Vietnamese To Van Binh from Russia says he and his family have returned to the country to welcome the traditional Tet (Lunar New Year) festival which falls on January 31 this year. Binh said they had made a two-week tour of five Central Highland provinces starting at Suoi Vang Lake which is located in Lac Duong District, about 20km from Da Lat. "We were all surprised by the freshness and beauty of the lake, which apparently is the largest in the region", he said. "The manager told us that the lake supplies fresh water for daily use for the entire city of Da Lat, and he kindly invited us to tour the lake in his motorboat. "It's a great opportunity for us to enjoy the lake and its rolling pine forests," said Binh, adding that he had never enjoyed a trip so much since he moved abroad almost 20 years ago. Next to the lake is the Ankroet Waterfall where French Governor General Jean Decoux chose to build the first hydro-electric plant in Viet Nam in 1942. Leaving Suoi Vang, Binh and his family travelled to Dak Nong where the M'Nong, Ma and E De ethnic groups have lived for hundreds of years. Binh said his group enjoyed the Len Gun Waterfall located in the Nam Nung Natural Preservation Area in Dak Song District. Tour guide Ho Thi Be said the waterfall is about 350m high and surrounded by virgin jungle. 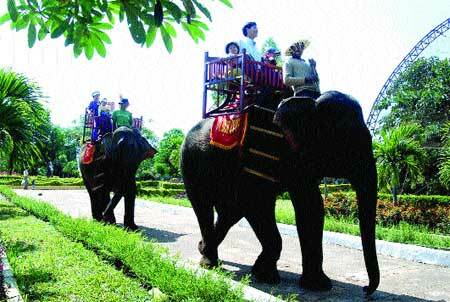 Riding high:Tourists enjoy the view from the back of elephants. The visitors were eager to find traces of tigers, gayals and other wild animals. "We were lucky to make this discovery," Binh said. Standing on the top of the waterfall, travellers can see stone cranes riding the currents through the thick spray from the tumbling water. Saying goodbye to the waterfall, Binh and his group continued their trip to Dak Lak which is home to the National Yok Don National Park, gongs and elephants. Deputy director of the Dak Lak Provincial Department of Culture, Sports and Tourism, Huynh Ngoc Duong, said a visit to the province was not complete without an elephant ride to Lak Lake. "The most interesting thing for travellers is sitting on an elephant's back to tour the lake and discover the daily lives of the M'Nong who live near the banks of the lake," tour guide Kieu Thi Mui said. Binh and his family were happy to join a gong performance with local artists. "We were really happy to enjoy real gongs performed by local men near a big fire and try ruou can (wine drunk out of a jar through pipes) which is very popular among the highlanders," said Binh. Located near Lak Lake is the palace of Bao Dai, Viet Nam's last king, which he built as a weekend getaway. From the palace, you can enjoy the lake's beautiful landscape and forests. As night fell, Binh and his family arrived at a bungalow located under an old tree where they cooked themselves with fish fresh from the lake. "We grilled fresh fish such as gudgeon and thac lac on the fire. They're very tasty and delicious," he said. Local man Ho Lim said the fish are valuable resources which bring us millions of dong per year. He invited Binh to his house to enjoy fried thac lac fish (cooked with noodles and scallions on a charcoal brazier). "We've eaten fried fish before, but nothing compares to this, particularly the dish cooked by Lim's wife," Binh said. Lim said that thac lac fish have become a speciality in many big hotels and restaurants in Dak Lak, but because of short supplies, several restaurants in Buon Ma Thuot often serve other fish, so eating the dish on the spot next to Lak Lake is great, Lim said. Leaving Lak Lake, Binh's family travelled to Gia Lai Province to visit the communal house of the Ba Na ethnic group in Hoai An District. The house is often built in the middle of the commune, said village elder Ya Sung. "We build the house using local materials such as wood, bamboo and rattan, without any nails," he said, adding that the communal house is a meeting place for local people where village elders make important announcements. The house is a place to worship the gods and deities. It is also a place for cultural activities like gong performances and other traditional festivals, said Ya Sung. "The communal house is our soul. It reflects our community's strength. We have been trying our utmost to preserve it," he said. The last leg of Binh's tour is Kon Tum Province where his group travelled Kon Plong, a mountainous district 1,000m above sea level, giving the province fresh air the year round, said tour guide Phuong Thi Phan. She led the travellers to Mang Den Town which is said to be the second Da Lat, where Binh and his family enjoyed immense pine forests, waterfalls and wild flowers. 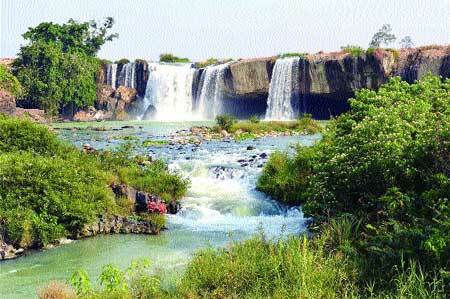 Making a splash: Dray Nur waterfall in Dak Lak attracts thousands of visitors year-round. Binh said he would never forget the boiled bamboo shoots dipped in garlic fish source with chilli. Restaurant owner Thai Thu Hang said the bamboo shoots can be used in many other dishes with pork and fish. Local woman Ho Thi May said many of the villagers earn a living from selling bamboo which is available in Kon Tum trade centres, Vinatex and Thanh Nghia supermarkets. May said apart from bamboo, Kon Plong is also famous for its chestnuts and medicinal herbs such as ginseng, medlar and cot toai bo, which are good for the health. The newly formed district is about 53km to the north of Kon Tum. Director of the provincial Department of Culture, Sports and Tourism Bui Thi Thanh Van, said the district's tourism potential went back to the late 19th and early 20th centuries when the French planted hundreds of pine forests and built resorts by the lakes, waterfalls and virgin forests which have become centres for eco-tourism. The Government has approved an eco-tourism project for Mang Den Town which is hub that connects Laos, Cambodia and other ASEAN countries. Doan Van Viet, deputy chairman of the Lam Dong People's Committee and deputy head of the National Tay Nguyen-Da Lat Tourism Year's Organising Committee, said with a paradise of flowers and the 120th anniversary of Da Lat, the province welcomed more than 3 million local and foreign visitors last year. "We hope to welcome 3.4-4 million this year," he said. Mai Hoan Nie Kdam, deputy chairwoman of the Dak Lak People's Committee and deputy head of the National Tourism Year's Organising Commitee, said her province was improving roads, accommodation and services to prepare for visitors. "We hope connections between the five provinces will be improved to promote tours linking Da Lat on Highway 27 to Buon Ma Thuot on Highway 14 to Pleiku in Gia Lai to accommodate 1.5 million guests this year," Nie Kdam said.